Marie-Anne Lagimodière (née Gaboury; 15 August 1780 – 14 December 1875) was a French-Canadian woman noted as both the grandmother of Louis Riel, and as the first woman of European descent to travel to and settle in what is now Western Canada. Gaboury was born in Maskinongé, Quebec, a village near modern Trois-Rivières. As a young woman she kept house for a priest there until her marriage on 21 April 1806 to Jean-Baptiste Lagimodière. 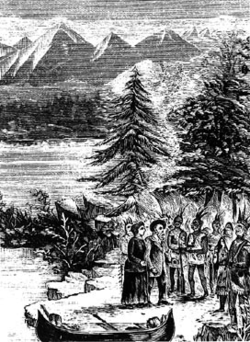 Lagimodière was originally from nearby Saint-Ours; he had become a Coureur des bois employed in the fur trade by the Hudson's Bay Company in Rupert's Land. Immediately following their marriage, and in defiance of the custom of the time, Gaboury travelled to the west with her new husband. They went first to the area near the confluence of the Assiniboine and Red Rivers near what would later become the Red River Colony, and, eventually, modern Winnipeg, Manitoba. They wintered at a Métis encampment near Pembina (under British sovereignty at the time but now in North Dakota), where the first of her eight children was born on 6 January 1807. The young family was once taken prisoner while trapping by Tsuu T'ina tribesmen because of their association with local Cree. Although they managed to escape on horseback, they were pursued for five days until reaching the safety of Fort des Prairie (also known as Fort Augustus, a counterpart to Fort Edmonton) near modern Edmonton, Alberta. Before his marriage, Jean-Baptiste had previously been involved à la façon du pays [in the style of the country] with a native woman who had borne his children. Marie-Anne was tolerant and accepting of the children arising from this previous relationship, although the other woman was jealous and reportedly threatened to poison her. Despite this incident, the Lagimodières generally had good relationships with the Aboriginal peoples they encountered. Marie-Anne was often regarded as an object of curiosity by the Natives during her travels, as she was invariably the first white woman they had ever seen – some were even led to believe that she possessed supernatural powers. On hearing that Lord Selkirk was establishing a permanent colony at the Red River, they returned to help establish the new Red River Colony in the spring of 1812. The early history of the settlement was characterized by struggles between the Hudson's Bay Company and its rival, the North West Company, culminating in the Battle of Seven Oaks in 1816. Although the Lagimodières managed to avoid involvement with the violent confrontations, Jean-Baptiste was asked by HBC representative Colin Robertson to take news of the events to Lord Selkirk. Over the winter of 1815–1816, Lagimodière travelled over 2,900 kilometers on horseback and on foot in fulfillment of this mission. During this time, Marie-Anne was obliged to seek shelter among the aboriginal tribes when the Nor'Westers took possession of Fort Douglas. On his return from the east, Jean-Baptiste was taken prisoner by the Nor'Westers and was imprisoned in Fort William until August 1816. The Lagimodières were not reunited until September 1816, after the unrest had subsided. In recognition of his service, Lord Selkirk awarded Jean-Baptiste a tract of land near the Red River, which the Lagimodières successfully homesteaded for many years. They had six more children, including, in 1822, Julie Lagimodière, the future mother of Louis Riel. Dying at age 95 in 1875, Marie-Anne lived to see Manitoba become part of the Canadian Confederation following Riel's actions during the Red River Rebellion of 1869–1870. She is sometimes remembered as the "Grandmother of the Red River", and many of the Métis people of the Canadian Prairies can trace their ancestry to her. The 1978 Canadian feature film Marie-Anne tells a fictionalized story of "the first white woman in Western Canada". Isobel Gunn, an HBC labourer who travelled to Rupert's Land disguised as a man. ^ Ismène Toussaint. "Jean-Louis Riel". The Canadian Encyclopedia. Retrieved 31 January 2011. ^ Lester, Tanya. "A Strong Woman". Indian Record. Vol. 48-50. Oblate Fathers; 1985. p. 10. ^ Maggie Siggins. Marie-Anne: The Extraordinary Life of Louis Riel's Grandmother. McClelland & Stewart; 13 October 2009. ISBN 978-1-55199-325-6. p. unpaged. ^ Historical and Scientific Society of Manitoba. Transaction[s]. 1888. p. 23–. ^ Inspiring Women: A Celebration of Herstory. Coteau Books; 2003. ISBN 978-1-55050-204-6. p. 17–. ^ Susan E. Merritt. Her story III: women from Canada's past. Vanwell Publishing Limited; 1999. ISBN 978-1-55125-037-3. p. 28-30. ^ The Story of Canada. Scholastic Canada, Limited; 27 September 2016. ISBN 978-1-4431-1954-2. p. 114–. ^ Nancy Millar. Once Upon a Wedding: Stories of Weddings in Western Canada, 1860-1945, for Better Or Worse. Bayeux Arts; 2000. ISBN 978-1-896209-33-3. p. 158–. ^ Doug Lennox. Now You Know Absolutely Everything: Absolutely every Now You Know book in a single ebook. Dundurn; 6 December 2013. ISBN 978-1-4597-2478-5. p. 2520–. ^ Brock Silversides. Fort de Prairies: The Story of Fort Edmonton. Heritage House Publishing Co; 2005. ISBN 978-1-894384-98-8. p. 6–. ^ Naming Edmonton: From Ada to Zoie. University of Alberta; 2004. ISBN 978-0-88864-423-7. p. 278–. ^ Joachim Fromhold. Alberta History - The Old North Trail (Cree Trail), 15,000 Years of Indian History: 1750-1822. Lulu.com; ISBN 978-1-105-96418-3. p. 177–. Dugas, Georges. The first Canadian woman in the Northwest, Manitoba Free Press, 1902. Irene Ternier Gordon. Marie - Anne Lagimodière: The Incredible Story of Louis Riel's Grandmother. Heritage House Publishing Co; December 2003. ISBN 978-1-55153-967-6. This page was last edited on 14 February 2019, at 22:42 (UTC).